Standard Vertical lift traffic barrier gate model TBG-1C is manufactured by Bridge Roadway Products, 1785 West Armitage Court, Addison, IL 60101. Please contact us using the website form, call 630-613-3190 , or email: bridgeroadwayproducts@brp-pro.com for more information about your specific project. Recommended Use – Designed to meet or exceed the current standards of the Manual on Uniform Traffic Control Devices (MUTCD) and the American Association of Highway Transportation Officials (AASHTO) for non-penetrable barriers used in conjunction with warning gates on movable bridges, reversible lanes of traffic or where similar traffic control applications up to 62 feet in length. Overview – The Barrier Gate Operator utilizes a heavy-duty industrial dual stage gear reducer and integrated motor gear box drive system. The gear box is self-contained one-piece construction which easily bolts into the operator framework. A coupled 3.25” diameter drive shaft or an optional solid 3.25” diameter drive shaft is attached through the gearbox to provide 35,500 in-lbs. of torque to open and close the Barrier Gate arm assembly. Each end of the drive shaft extends through the side of the operator housing with mounting hubs to attach to the gate arm assembly. An Internal rotary cam switch box is mounted below the arm drive shaft and is chain driven with a SmartLUBE® chain from the main drive gearbox. The operator is approximately 41 inches in width, 25 inches in depth, 58.5” inches in height, and weighs 1500 lbs. Operator Housing – The Barrier Gate Operator housing consists of a welded heavy-duty tubular steel frame of 2” square-tubing of ¼” wall thickness. The frame is welded to a 4” x 3” x 3/8” angle iron base providing a robust structure for mounting of the operator to its foundation providing for 14 anchor bolt locations. The standard housing frame is stainless steel or optional post fabrication hot dip galvanized. The framework is enclosed with 12 Ga. (.1094″) powdered coated cover skins and doors providing weatherproof protection for the internal components. Cover skins and doors are also available in optional stainless steel or hot dip galvanized finish. All skins and covers are attached to the framework using ¼” stainless steel six lobe tamper-resistant security machine screws, with stainless steel split lock washers. This hardware provides for weather resistance, security, and maintenance accessibility for authorized personnel when required. Lockable access doors allow easy access to the front and rear sides of the operator enclosure for internal electrical panel, controls, and a third side door for access to the manual override system. All doors have, door holders and latches sufficient to compress weatherproof gasket seals. The Drive shaft/hub openings are sealed as well. Operator Housing Mounting – The system shall be mounted to a suitable foundation, as specified by the customer, using up to 14 1” diameter anchor bolts. The base of the unit will provide 1-1/8” diameter mounting holes for this purpose. A layout template will be provided. Drive System – The main drive system is a dual stage gearbox / 1 HP motor unit. It is a self-contained drive system which easily bolts into the main framework of the operator frame. The drive unit features a 1087:1 drive ratio between the motor and output shaft. The output of the gearbox is a hollow shaft style to accommodate a 3.250” diameter solid or coupled stainless steel drive shaft. The output speed of the unit is 1.6 RPM, which will fully open or fully close the warning gate at speeds that can be controlled and adjusted through the motor’s Variable Frequency Drive system (VFD). The VFD enables a sinusoidal action when in operation. The gearbox has an output torque of 35,500 in-lbs. and weighs 663 lbs. The gearbox shall be filled with synthetic oil for operational temperature ranges from -40 C to +40 C. Drive housing includes special surface protection paint for outdoor application. Internal Braking System – The drive motor includes its own electronic braking system with 88 in-lbs. of brake torque. This provides nearly 95,600 in-lbs, of braking torque to the output shaft of the operator. A special hand brake release is included for manual operation of the drive system. Manual Operation – The output of the fan shaft on the motor will have a socket connection, where when the system requires manual operation, the hand brake release is used to disengage the system brake and a battery powered drill unit with drive socket can be used to drive the motor/gearbox system manually. Limit Cams – Standard equipment configuration includes 8 position cam switch mounted in a NEMA 1 rated enclosure capable of housing up to14 limit cam limited switch if specifications require. An optional NEMA 4 enclosure is also available. Barrier Gate Arm Mounts – The Barrier Gate Arm Mounts are constructed with heavy-duty all carbon 3’ x 10” tubular steel with steel tenon offsets designed to achieve the specified height and location of the Barrier Gate Arm. Arm counter weights are steel plates bolted to the drive frame. Both frame and counter weights are provided with a powder coat or optional hot dip galvanized finish. The frame and counterweight system is affixed to the operator shaft hubs with armor coated steel bolts. Barrier Gate Arm – The arm is a double rail arm constructed of 3” aluminum square tubing. Both upper and lower rails are separated by solid aluminum plates. Both ends of the Arm assembly bolt to powder coated steel components to provide for strong connections between the arm assembly and the drive frame. Armor coated steel bolts are used on these connections. A minimum of four stainless steel gusset cables, eyebolts, and associated hardware will be used to support the arm between the arm assembly and the steel drive frame. Front and rear arm surfaces shall be covered with alternating red and white high intensity reflective stripes (per MUTCD regulation/specification). Maximum length is 31 feet. Barrier Gate Arm Impact Cables – The Barrier Gate Arm include 3 6×19 x ½” Series 300 stainless steel cables designed to dissipate the energy of a vehicle impact. Impact cabling is located inside each of the 3” aluminum tubes and one between the 3” aluminum tubes. Barrier Gate Arm Interlocking Mechanism – The barrier arm ends shall be outfitted with a steel (interlocking) system. One arm end (oncoming traffic) will be out fitted with a steel bar and stainless steel anchor nut with the opposing arm end (off going) outfitted with a powder coated steel yoke box assembly. If a single Barrier Arm is used the arm will interlock with a steel yolk anchored on the opposite side of the roadway. 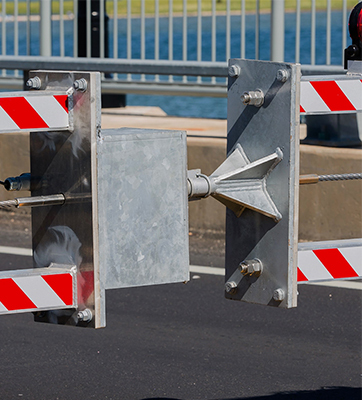 In either configuration, in the closed position the barriers arm will maintain a continuous barrier condition across both lanes of the roadway. All steel components are standard with powder coat or optional hot dip galvanized finish. A proximity style limit switch and switch flag are included to verify that barrier arms are in the “locked” position. Wiring, Control Wiring & Safety Switches – A manual disconnect switch is included to protect servicing personnel. Safety switches are installed on all of the access doors disabling the unit while being maintained our serviced. These safety switches can include an override function for the use while installing and testing if specified. Control components and terminal blocks are installed inside a NEMA 4 electrical enclosure inside the operator housing. Control wiring will be clearly labeled where appropriate and referenced on the wiring diagram included with the unit. Standard wiring is #14 AWG stranded unless otherwise specified. Warning Lights – Warning lights per customer specifications (MUTCD/AASHTO regulations/specifications) shall be installed along the upper rail of the barrier arm assembly, wired, and controlled per customer specifications. Warranty – System components manufactured and supplied by Bridge Roadway Products shall have a 3 Year limited warranty against defects in materials and workmanship. Overhung load capacity 14,610 lbs. Dimensions 58.5”, 9 CM High 41”, 104.14 CM Wide and 25”, 63.5 CM Deep or to specifications. Mounting Base Dimensions 45”, 114.3 CM Wide and 29”, 73.66 CM Deep or to specifications.